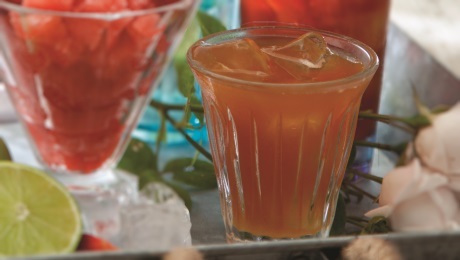 Iced tea is super-refreshing on a hot day and an ideal alcohol free option for your guests. Boil the kettle and make the tea in a large saucepan with approximately 1.5 litres of water. Add the sugar and allow to dissolve. Leave for about 5 to 10 minutes but be careful the tea doesn’t stew. Strain and allow to cool completely then pour into a jug with the lime juice and garnish with lemon slices. Store, without ice, in the fridge until needed then serve in tall glasses with plenty of ice.